Kuala gives you everything you need to setup, track, measure and optimize your performance marketing. Access detailed analytics and view reports about your traffic. Manage all your campaigns and offers from a single platform. Uncover opportunities and optimize your campaigns. View traffic reports and work with data in real-time. Create Targeting Rules for redirecting your traffic. Complete access to the Kuala API for automating your workflows. 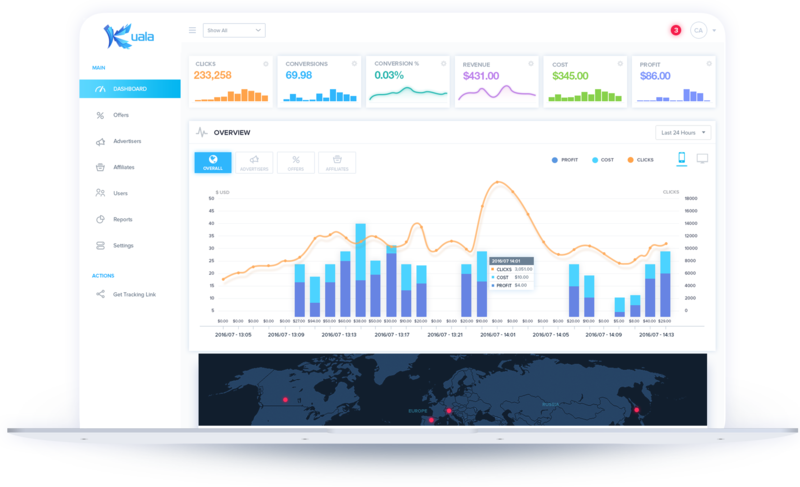 Uncover opportunities and optimize your campaigns with intuitive dashboards. Attribute clicks and track conversions using Pixels & Postbacks. Advertisers and Affiliates can create unlimited Company User accounts. Kuala’s reporting suite gives your partners access to detailed analytics for optimizing their campaigns. Every user in your Kuala account gets their own login portal and dedicated dashboard. Access detailed reports in realtime to find with actionable insights. Track your campaign performance and optimize your ROI. Use Kuala to track and manage all of your performance marketing campaigns. Setup and manage all your campaigns and offers from a single platform. Target users by Location, Device or use custom parameters to route your clicks. Connect your own domain names and manage IP Whitelists for Advertisers. Quickly setup conversion tracking with Tracking Pixels or Postback URLs. Setup and manage user accounts for your advertisers, affiliates and employees. Enterperise Link Tracking For Everyone.